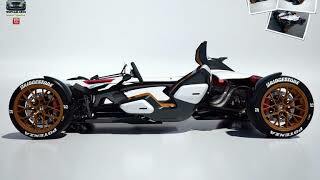 As announced, Honda will be raising curtains off its Honda Project 2and4 Concept 2015 at the Frankfurt Motor Show 2015. The model will be released to celebrate company’s spectacular stand as a world’s leading engine manufacturer. Here I must say that the model design clearly portrays their proficiency in presenting its buyers both two and four wheel rolling automotives. 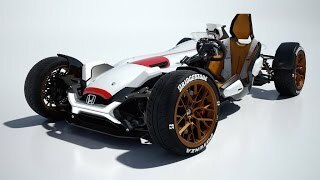 Let us have a look at the review of Honda Project 2and4 Concept 2015 to know more about it. It took more than 80 designers and builders to participate and compete and further the winning result is Honda Project 2and4 Concept 2015. Designed and architecture with an intention to achieve high-end results. Starting with the body design, I would say it’s compact and structure like any bike. In fact it’s an impeccable amalgamation of bike and car design. The engine mounted beneath is Honda’s legendary RA272 of 1965. Weighing just 405 Kg, the engine power turns more robust, taking this decent monster to better performance level. The driver’s seat is commendably positioned and sits over the rod. With its suspension providing required comfort. Seat has been positioned in a way that it delivers perfect stance to ride speedy and for longer duration. The 1.0 Liter V4 engine powering the Honda Project 2and4 Concept 2015 cranks total output of 212 hp and peak torque of 118 nm mating to six-speed DCT transmission. The generated power is capable enough to take your performance figures o a better height and credit to this exceptionally goes to the legendary engine and the low weight body.